“Government’s meddling in religious activities over the years has not really helped issues, rather, it has led to an increase in religious fanaticism and extremism in Nigeria, some go as far as taking laws into their hands to cause mayhem over government’s policies or decision that didn’t favour their interest. The insurgency ravaging North Eastern part of Nigeria is a good example“. Nigeria’s constitution both past and present proclaims the secularity of the Nigerian state. According to Wikipedia, a Secular state is a concept of secularism, whereby a state or country purports to be officially neutral in matters of religion, supporting neither religion nor irreligion”. A secular state also claims to treat all its citizens equally, regardless of one’s religion. Happenings in our polity over the years have shown we have been divided between two powerful religions, Christianity and Islam. Both religions have large followers in Nigeria; belonging to any of the two dominant religions is rather expected. A person’s social status is often determined by religious affiliation. The similarity between both religions is the absolute certainty that they are correct, their beliefs are the will of God, the highest authority over man and therefore their belief should be respected and worshipped. 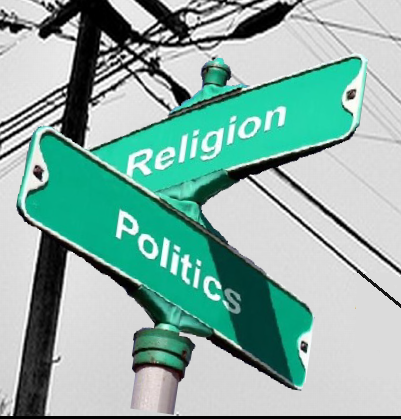 As it is today, one can’t separate “Religion” from our “Politics”, both are like Siamese twins, both religions have been a dominant factor in determining who rules, who gets appointment, promotion, a job and many other things. In Nigeria, the undue attention being given to religion has widened the gap between these two adherents, both adherents view each other with deep suspicion, both believe they deserve more attention, when this attention isn’t forth coming, its often interpreted by both sides as being persecuted. Government’s meddling in religious activities over the years has not really helped issues, rather, it has led to an increase in religious fanaticism and extremism in Nigeria, some go as far as taking laws into their hands to cause mayhem over government’s policies or decision that didn’t favour their interest. The insurgency ravaging North Eastern part of Nigeria is a good example. These actions have already done more harm than good, religious, ethnic and political clashes we have had over the years in various parts of these country have not in anyway achieved any meaningful success, rather it has multiplied the ingrained religious and tribal hatred and suspicion amongst different religious and tribal groups. Our clerics’ meddlesomeness in politics in recent times and their extra ordinary arrogance at the pulpit is appalling. I was at a church service recently when the preacher arrogantly told the congregation to pray for a particular South East state governor to lose his re election in 2015 over what he perceived as giving undue attention to muslims in his state, the narrow minded preacher didn’t cite various unlawful activities of the governor as reasons why he should lose election but rather chose to cite undue attention to muslims, the hypocrisy of such men of God are always exhibited when such governor becomes their guest, they embellish their sermons to be that of praises to the governor’s listening pleasures. These double standard approach of our clerics have left these incorrigible politicians with no choice but to do whatever suits them because they have silenced our clerics’ conscience with heavy alms and offering. Some of our clerics have lost their credibility at the altar of politics, they have virtually turned deaf and dump on government’s insensitivity to the sufferings of the people, some have practically relocated to Aso Rock Villa, jumping from one place to another with Mr. President, praying and defending his deeds. These meddle some acts of our clerics have resulted to the general public taking a rather apathetic approach towards religious issues. More and more Nigerians are becoming secular which our constitution recognizes, we are pragmatically accepting a view which rejects any form of religious faith and worship. In an argument with a friend over why he won’t vote General Mohammadu Buhari as president of Nigeria in the forth coming general elections when he knows he is credible, his answer was simple and straight, “if I vote General Buhari and he wins the presidential election he will islamize Nigeria”, that is the same answer you will get from an average Christian, courtesy of repeated sermons over the years, his answer was funny and stupid, because even in Islamic countries, minority Christians still have freedom of worship, why will a Muslim president Islamize Nigeria? Where has it happened in the world? And what does he stand to gain? Likewise Muslims, they see no reason in voting a Christian in any capacity, even if the Christian is more qualified than his Muslim counterpart. The use of religion for political gains or to incite violence should be avoided, we should be mindful of our utterances in public gatherings especially now general elections is close. Any individual that thinks he is credible enough and has all it takes to get to a position should come out and convince Nigerians regardless of religion. What we need in this our present condition is to separate religion from politics and abide by the secularity of our nation which our constitution recognizes, United states and Turkey are Christian and Muslim dominated countries respectively, both countries’ constitution proclaims the secularities of their nations, they have to a reasonable extent alienated religion from their politics and political activities, why can’t we, a nation with almost same population of Christians and Muslims do same? Our unity in diversity should be our unifying factor not the other way round. Religion being a matter of individual choice should be left where it is for our clerics to take care of our souls while our leaders take care of the businesses of governance. We should resist the temptation of making religion a tool of our national partisan politics, its not healthy and has not contributed in any way in uniting us as a nation. Joe Onwukeme: An Idealist, is a Political and Social affairs analyst, writes from Enugu.